You must make bookings at least 5 minutes in advance of the time at The Florence. A grand old dame of a pub in the centre of Herne Hill and opposite Brockwell Park. In the front, we are large, light and airy around our central island bar. Out the back, we have our large decked garden, family friendly. To eat, we serve traditional pub food with a modern approach. We go for product quality over marketing for our draught and bottled beer collection and have a range of rotating ales, including those brewed in our own micro-brewery. Dog friendly, date-night friendly, spot of food and then drinks for a celebration friendly, bring your folks for lunch when they are visiting friendly. You get the idea - we are quite friendly. Nice ambiance. Decent beer selection. Nice outside patio with small kids play area. Very poor food quality. The vegan nut roast was really awful - just a pile of slightly crispy chickpeas and lentils with no flavour or anything to bind it together, really really rubbish. Awful roasts, the beef was so tough I couldn’t chew it and had to leave it. Roast potatoes were soggy. The beef roast was £17 so way overpriced for such poor quality meat.The atmosphere is good though and servers were nice. The food was ok, but i have had much better roasts. The yorkshire pudding was not good at all and the potatoes were not crispy. But the gravy was good and so was the pork. The atmosphere wasnt great though as it was Very loud in there, had to go outside to hear each other! An agreeable pub, with a lovely beer garden. The food is nice and vegetarian friendly. Unfortunately, the need, observed in many places, to play constant background music, makes publicans speak louder, creating an escalation of noise which is rather unpleasant. Lovely place to meet and eat. Friendly staff. Good menu selection and high quality grub. Had a business meeting and during the day lots of space and choice of tables. Nice and relaxed. I booked Tbe Florence because of the advertised 'children's play area'. On arrival it became clear that this doesn't exist and hasn't done for 2 years. Disappointing as I'd promised my 5 year old. So don't book here if you're expecting a kids area. The staff though were fantastic and helped keep him entertained. Very good food and friendly and professional staff. We had a great time! The staff are very accommodating especially the guy manning the outside bar! For an extremely busy day the time to get a drink actually wasn’t that bad! Great quality food and friendly service. A lovely place to go for a Sunday Roasr! Great pub, really good space. The food was great and service was too. Just a very cramped space for the ladies on a busy day/night! Rather limited menu and not particularly inspiring. The food itself wasn't great, especially for the price. Nice place to sit though and the staff were very welcoming and attentive. Very good lunch. Not too busy and tasty grub. Staff were very polite and and accommodating. Such a disappointment, such a shame! We arrived and were ignored, not even a drinks order was taken despite sitting in the restaurant, we had to go to the bar. Then we were advised that there was no roasts left (among other items on the menu. Then, we ordered some starters and mains, half an hour later told they didn’t have the starters we ordered. Then, when the food arrived, it came at the same time as the starters which we had ordered. When we ordered deserts, same problem again, some of the deserts on the menu had run out. So disappointing, I really wanted to love this place! 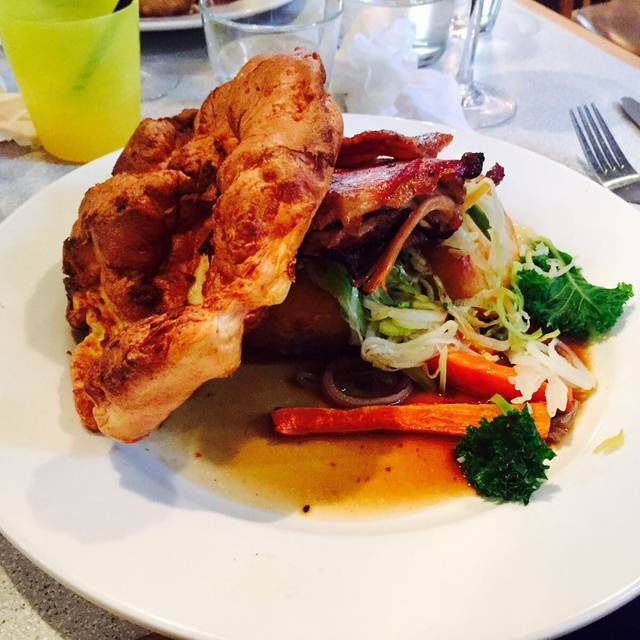 We booked for a Sunday lunch after a very cold walk in Brockwell Park -- the Florence is a great find,, very busy but service was good and the food excellent - great Yorkshire's. We'll come back again in Spring. Excellent celebration meal for Mothers Day and a birthday. Friendly service, great food/beer and a happy atmosphere - what's not to like. I had my birthday there. Staff were very patient and accommodating. We had to add extra people at the last minute and a 4 week old baby. They handled all our extra requests admirably. The food came quickly and was tasty, we will definetely be going back. Very slow service. Asked for things and they never arrived, such as glasses for the water. Food was very average and small in light of the cost. Also cold. Large, busy pub with decent roasts. Tons of families when we went on a Sunday, so plenty of high chairs available. Starters came quickly enough, but drinks we ordered seemed to get forgotten. After starters we waited an entire hour for our mains. We had to ask about them 3 times. With a 14 month old in our party, that made things hard as we had to keep him busy, walking him inside, outside, everywhere. I wouldn’t return simply because of that wait, and because the pub is actually super noisy once full so you have to shout a bit. But food was ok.
A great find. Booked on a whim for Sunday Roast Lunch and was pleasantly surprised. Little gem of a place in Herne Hill. I advise you book in advance. Overall the Florence was very good and we enjoyed the food and the ambience. The one downside was the service, the service team seemed very nervous regarding a large booking and didn't seem to be communicating with each other. Two people asked us the same question. The gentleman serving our table could have been deemed to be rude and was by our table, perhaps slightly aloof. Sadly having been before it was a real let down. I had to order drinks at the bar and flag anyone down to order anything at all. They all seemed pretty hungover. And nobody looked like they knew what they were doing. The food was reasonable. Sadly that’s the best bit about it. Set up was shambolic. We booked a table. It wasn’t there/someone was sitting at it/it wasn’t ready so we sat elsewhere. Rather than solving the problem of our table the staff harassed us to keep moving to different tables because the tables we were sat at were already booked (!). Service slow. 20 mins to get served at the bar 30 minute wait for a small basket of chips. Staff unpleasant about it all. I won’t be back, and if you are planning a special event in the Florence, don’t bother. Lots of nice places in the area, so go to one of those. Great Sunday roast lunch experience. Very very busy so lost service at times. But overall a great pub. This is the fourth time i've visited to eat now. The only couple of things that let it down a bit this time round was the music was just that little bit too loud to be able to hear each other talk over the table, the second was the heat in the restaurant, we were all feeling slightly suffocated by the end and couldn't wait to get outside for some air! Maybe if the back door had been perched open a bit as it was quite a warm day, it would've made it more comfortable. Previously a favourite haunt but let us down this time. Guy behind the bar had very scant knowledge of beers on tap or in bottles, half of the items on the menu were off (though it was a Saturday night), the food was underwhelming and misadvertised (e.g. 'skin on chips' were just frozen chips) and arrived at different times with no apology, music was loud and dancey, room was cold as door propped open, pints cost £6... All in all wish we hadn't chosen it for dinner with family - not a good pick despite past good experiences. Service was sooooo slow. 50 mins wait. Don't bother. This looks like a wonderful pub but upon arrival we were told that the play room is no longer in use. There was therefore no space at all for children to be except at the table. We did not stay as the children were not comfortable. Amazing food, great service would definitely recommend. Food was great as usual, service was a bit slow but it wasn't a bit issue we weren't in a hurry.